Welcome back to our blog page here at Benjamin Brothers! The amazing folks of Pasco County, FL have come to expect a certain level of expertise from Benjamin Brothers and we’re used to rising to those high expectations. Our customers expect a great deal from us because we consistently deliver excellent customer service, professional work, and efficient home visits and service calls. No matter what kind of HVAC frustrations you’re dealing with, Benjamin Brothers is here to help! Contact us for AC repairs, AC unit replacements, and anything else related to heating and cooling. Whether you’ve lived in your home for years or you’ve just moved in, there is so much to think about when you’re a homeowner. One needs to consider the condition of the roof, the care of the yard, and the state of the large appliances. Your appliances that run via programming can often start to show significant wear due to the fact that they are in use so much more often than the stove, dishwasher, or garbage disposal. These large appliances like your fridge, furnace, and AC unit, need special attention and regular maintenance. In today’s blog, we’re going to take a look at everything that you need to know in order to keep your AC unit running strong for years to come. Since everything that you breathe in your home passes through your HVAC filter, you definitely want to make sure that you are using the best one available. Cheap air filters often don’t filter out as much dust and allergens and they also tend to need changing much more frequently than filters of better quality. If you want your Pasco County home to be as free of dust, allergens, and bacteria as possible, make sure you get a high-quality filter. When you have a quality HVAC or AC unit, you definitely want to give it enough room to properly function. When items are leaned up against it or placed too close, your unit could face a major blockage of airflow. Make sure that you clear enough space around your AC unit so that it has the space that it needs to do its job. All HVAC units make loud noises when they’re running, but when your unit starts to make sounds that are unlike the sounds of the past, this could be a sign of an unhealthy unit. Listen to changes in the sounds of your HVAC so that any problem can be dealt with in an efficient time frame. Most people don’t realize how much of a difference a clean filter can make until they realize that they are constantly breathing in dust and allergens. AC filters need to be changed or cleaned once every three months and when this doesn’t happen, you’re actually putting yourself and your family at risk for health conditions and breathing concerns. If it’s been a while since you changed your AC filter, we can definitely help you out! It’s recommended that Pasco County homeowners and business owners get their AC units inspected at least once per year. There are some problems that your AC unit might encounter due to old age or mechanical failure that aren’t huge issues at first but could easily turn into fiascos if left to worsen. One small leak left untreated for weeks and months at a time can lead to extremely expensive repairs or even the need for an HVAC or AC unit replacement. Having responsibilities like taking care of your furnace and HVAC can seem like intimidating chores, but if you’re a homeowner, it’s your responsibility to make sure that these applications are running at their best and most efficient. Getting the most out of your AC unit is simple and doable for anyone; simply pay attention to what your unit is looking like, sounding like, and how it is filtering. When your unit is running its best, you’re breathing the cleanest air, enjoying the best temperature, and experiencing the most contented life. 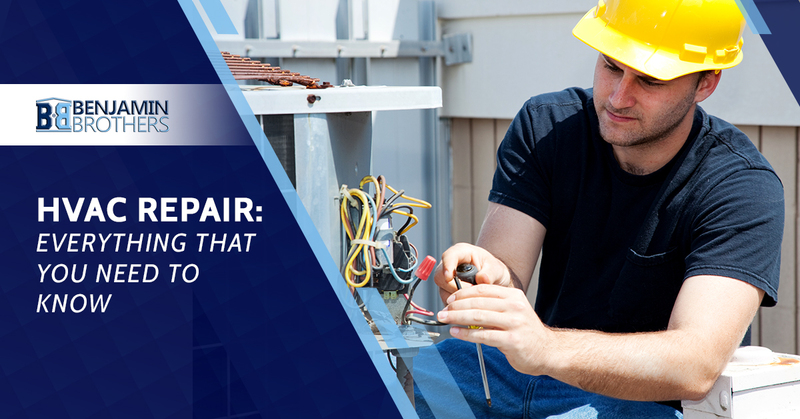 If you’re needing some small or significant HVAC repairs in Pasco County, why not contact the local experts? Benjamin Brothers is here to help! Whether you’re needing residential or commercial, repair or replacement, we can handle whatever job you’ve got. Contact us to schedule service or get a free estimate in Pasco County!